View all coupons from stage stores, also valid at Goody's, Peebles, Bealls Texas, and Palais Royal. Get $15 off when you spend over $40, print coupon and present it at your local stage store. Get up to $70 off your purchase when you spend over $200. Spend $150 or more at Stage Stores and get $30 off your entire purchase. Save 30% on your total regular, sale & clearance purchases when you use your store credit card. Get 25% off with any other form of payment. 40% discount on any single item at your local Stage store. 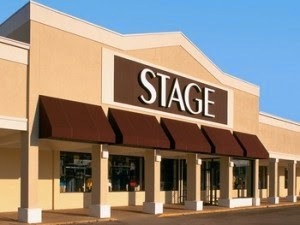 Stage is a middle-class retail clothing chain that operates in small to midsize communities in parts of the United States. the chain is operated by Stage Stores Inc, which also owns Bealls, Goody's, and Peebles stores. In addition to their vast clothing line Stage has other departments offer furniture, home decor items, gifts, and bath products all at reduced prices. Use the coupons above for extra savings.